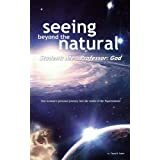 NEWLY RELEASED ‘SEEING BEYOND THE NATURAL, Student: Me … Professor: God’ title available in both kindle and Paperback!! SEEING BEYOND THE NATURAL, Student: Me … Professor: God is now available in Paperback. To order your copies, please visit: http://www.amazon.com/Seeing-Beyond-Natural-Student-Professor/dp/1496155033/ref=tmm_pap_title_0 See a recent 5 star review. Also available in Kindle. This book is bound to change anyone’s life.